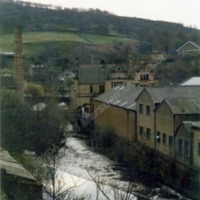 Looking down Hebden Water towards its confluence with the Calder. 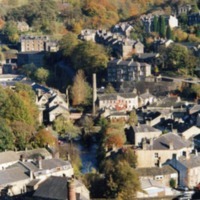 The buildings immediate right have been replaced by purpose built shops and offices and above them the former Council Offices. 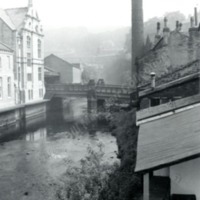 The chimney of Bridge Mill on the left. 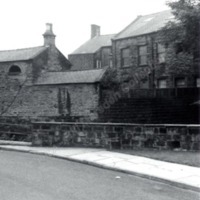 The lean to structures on the right have all gone. 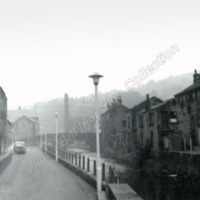 The Council Offices are on the left and the big chimney is for Bridge Mill. 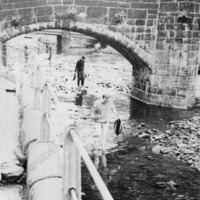 Looking up towards the Old Bridge. 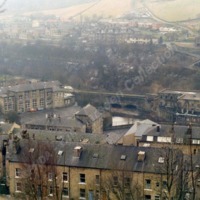 The buildings on the right are on Bridge Gate. Showing the rear of Westbourne House. 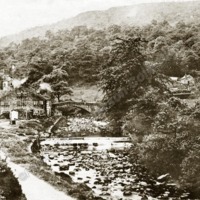 The low building on the left was at one time a stable. 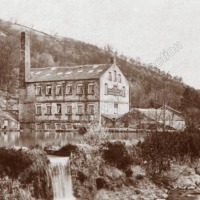 Originally a water powered cotton mill, by the time this photo was taken it was used by Frank Leelo as Tea Rooms to cater for the vast number of visitors to Hardcastle Crags. The Lodge at the gates into the Crags is on the right hand side. 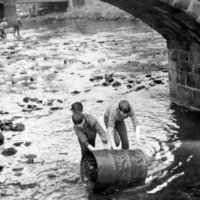 Civic Trust volunteers collecting rubbish from the Hebden Water in the centre of Hebden Bridge. Probably late 1960s. St George's Bridge at the top. 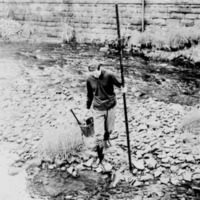 David Fletcher 1968 anuual clean up of Hebden Water through Hebden Bridge. 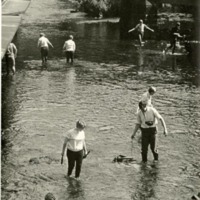 The Civic Trust's annual clean-up of Hebden Water in the town centre seen here by the old pack horse bridge. 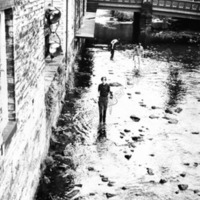 The Civic Trust's annual clean-up of Hebden Water in the town centre seen here by the weir adjacent to Bridge Mill. 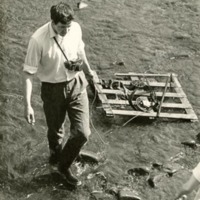 Philip Round in the centre. 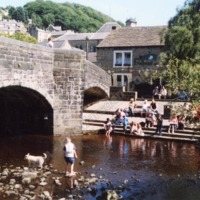 The Civic Trust's annual clean-up of Hebden Water in the town centre seen here by the old packhorse bridge. 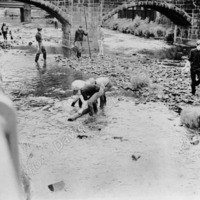 The Civic Trust's annual river clean-up in the town centre seen here from Old Bridge looking towards St George's Bridge. 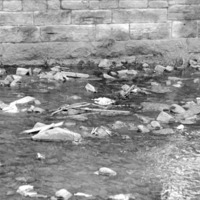 Cleaning Hebden Water in the centre of Hebden Bridge, organised by the Calder Civic Trust. 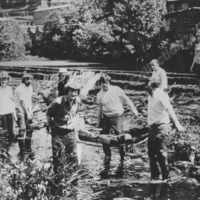 For several years the Calder Civic Trust organised an annual clean-up of Hebden Water in Hebden Bridge. 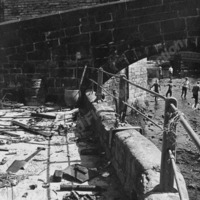 Viewed here from under the Old Bridge with St Georges Bridge top right.